Pomegranate Homemade Wine Recipes – It’s Going to Be Popular! Pomegranate homemade wine recipes are relatively new to the wine market, so depending on where you live in the world; you may or may not see it at your local winery. However, if you’d love to taste an amazing flavor in a wine, you may want to consider making your own wine from pomegranates. Wine is perfect for cocktail hour, with appetizers, with dinner, or as an after dinner drinks. Wine from pomegranates is perfect for serving with fruit puddings, desserts, or even with cheese and crackers. You’ll love the tangy and full-bodied flavor of this wine! Because the pomegranate fruit has so many health benefits, it’s a wise choice for those who relish the idea of a glass of wine with the meal. This potent wine can also be used to make pomegranate sauce to use with meats such as poultry, or over delectable desserts. You’ll love the fruity aroma and the way this red wine looks in your wine glass! Be the first of your friends to offer it at your next dinner party (use one of our recipes!). If you like having some around you may even check out your local wine shop, supermarket or some online retailers to see what they have to offer. Peel the fruit and remove the seed-juice sacs from the bitter white membrane dividers. Ten fruit are sufficient if 5-6 inches in diameter, 15 are required for 3-4 inch diameters. Meanwhile, bring the water to boil with the barley in it. Simmer for about 5 minutes, and then strain onto the pomegranate seeds, sugar, and lemon juice in the primary fermentation vessel. When cool (70-75 degrees F.), add the activated yeast and nutrient. Cover and allow to ferment vigorously five days, then strain into secondary fermentation jar and fit with fermentation trap. When wine clears, rack and bottle. May be good in six months, but improves at one year. Split open the pomegranates and remove the seeds. Pour all of the seeds into a bowl. Throw out the pits and skins. Crush the pomegranate seeds in the bowl thoroughly. Add all of the other ingredients to the pomegranate except the yeast. Stir well to dissolve the sugar, and let it sit overnight. The specific gravity should be between 1.090 and 1.095. Sprinkle yeast over the pomegranate mixture. Stir daily for 5 or 6 days, or until the specific gravity is around 1.050. Strain the must out and squeeze the juice lightly so that too much tannin does not escape from the seeds. Siphon into a secondary fermenter and attach an airlock. Tips For dry wine, rack the mixture for three weeks, and every three months for one year and then bottle. For a sweet wine, rack for three weeks. Add 1/2 cup sugar dissolved in 1 cup wine. Stir gently, and place back into secondary fermentor. Repeat process every six weeks until fermentation does not restart with the addition of sugar. Rack every three months until one year old. 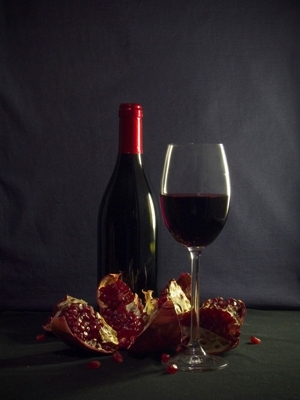 The pomegranate wine may taste best if you store it for one year without drinking it. Read enough about homemade wine recipes and want to discover more about the antioxidant drink?